Do you include a clear call to action? Give your prospective students a clear and simple next step and they will be more likely to continue engaging with your content and moving closer to the conversion you want. Links in your body copy are great, but if you can give a bold, simple and singular CTA that draws the eye, you will stand a much stronger chance of a click-through. Whether your CTA is a webinar registration, a link to a program description, a PDF download or any number of other options, a clearly labeled button will make the process simple and accessible to your prospective international students. Quick tip: Remove any excess links. You want to create a clear path to the most relevant information that will move your audience through the funnel. Don’t distract them with multiple links – it can be overwhelming. A single call to action is usually your best route to engaging your prospective student and confirming that your content is working. (Remember all that smack we talk about tracking? Do that). Are the images engaging and relevant? Do your emails include imagery? Are they stock photos or actual students? If you are using stock photography, can you select images that are believable? Your international students will see straight through the posed “business” or “classroom” or "campus" stock photos with perfect details, lighting and plastered smiles. You know the ones we mean. Using photography in your emails is a great opportunity to make your campus seem real, friendly and accessible to prospective students. Can you gather some photography that shows the true character of your institution? Quick tip: Can you host an informal pizza party for an international student club on campus and collect photographs over lunch? Your prospective students love to see that your campus and your community is real, genuine and authentic. Contests for student campus photo submissions also work to increase your photo options. Authenticity is more valuable than perfect poses and lighting. Whose email signature is used? If all of your emails are simply signed: “the admissions team” or another generic group title, it’s time to consider whether you can take a more personal approach. 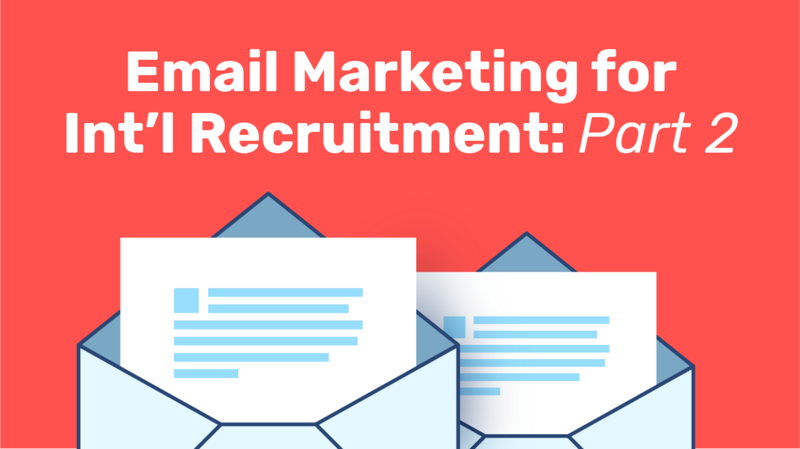 Email is a great way to send messages from the strongest influencers at each stage of the admissions process and make your institution seem more human. At the top of the funnel, can you sign the emails from one particular admissions officer and provide a headshot with some contact information? Putting a face to the admissions team makes your institution seem more real, and therefore more accessible. You are building a relationship with a real person on both sides of the conversation. Students may be more inclined to reach out when they know there will be a real person on the other end who is available, willing and excited to speak with them. At the bottom of the funnel, you might consider signing the emails from the dean, the president or another figure of authority at your institution. If you can include a short video clip, even better! I don’t mean a perfect, production video. I mean a raw, real 30 second clip of your dean or your president around campus talking right to your prospective students. Make your institution seem human, relatable, real. Quick tip: add Skype and WhatsApp contact information into the email signature. Using these tools may prove more effective than traditional email and phone alone. Be sure you are set up to respond in a timely manner. A few hours is great. Within 24 hours is important. Longer wait times may prove detrimental. When are you sending your emails? Have you considered the time zones of your audience? Granted you may not be able to make the timing perfect for everyone, but the fewer people who receive your emails in the middle of the night, the better. Quick tip: review the countries of origin the prospective students in your workflows. Are the majority in China? India? Can you adjust the timing so that these students receive the email at a time that is appropriate for them? This is just a guide. The success of the advice above is entirely dependent on the unique characteristics of your institution and your prospective student audience. You might find that for one program, emails sent late at night resonate. In another, you might see that early morning emails work best. Maybe your MBA students are drawn to deeper and more complex content than your Engineering students. Maybe vice versa. Monitor your analytics; see what works. Where are you seeing high open rates? That says something good about your subject line and intro text. Low click-through rates after the open? Your content isn’t resonating. Can you use any of the above tips to cut down distractions and streamline the information? Did you capture the wrong audience in the first place with the wrong digital ad campaign? Give it a shot. See what happens. And remember, we’re here to help. See you at Nafsa? Let us know and we'll set up a meeting. info@intead.com.